Brooklyn, NY - Assembly Member Simcha Eichenstein on Sunday presented an official citation to Mr. Shea Langsam, owner of Fish to Dish, to commend him for his kindness in welcoming a competitor, Yossi’s Fish Market, into his store following a fire that destroyed the building that housed Yossi’s Fish Market. Following a destructive fire on Jan. 12, Yossi Heiman, owner of Yossi’s Fish Market locates at 13th Avenue and 54th Street in Borough Park, Brooklyn, was left without a location from which to operate his business. That night, Eichenstein coordinated short-term housing for the residents of the apartments above the store. 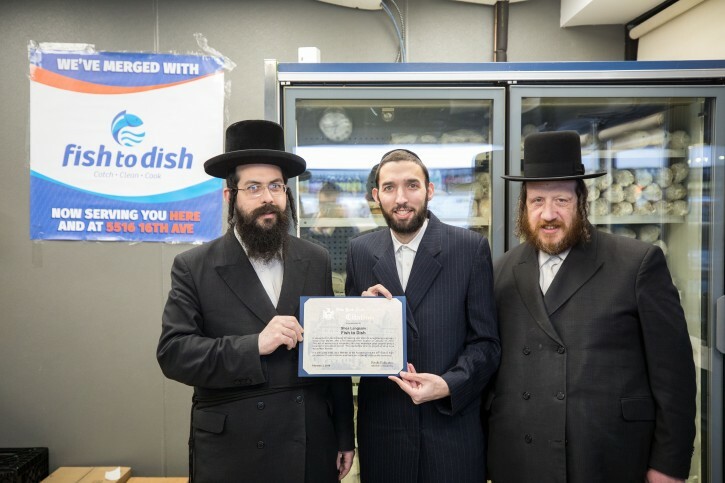 At the same time, Shea Langsam, owner of Fish to Dish, immediately reached out to Mr. Heiman to generously offer that he operate his business from a section of Langsam’s store, Fish to Dish, located just a few blocks away at 1280 43rd Street, in Borough Park, Brooklyn. “I want to express my deep appreciation and heartfelt thanks to Shea Langsam from Fish to Dish for what he’s done,” said Yossi Heimen, owner of Yossi’s Fish Market. “As soon as I heard after Shabbos that Mr. Heiman had a fire, I immediately called him and offered to help,” said Shea Langsam, owner of Fish to Dish. mi kamacha yisroel! now lets hire Jews instead of illegal Latinos. Naftuli Moster, this comes all from an illiterate yeshiva education. YOU make sure to send your kids in public schools to educate them when they see a burned down store they will rob and pillage it. Absolutely heart-warming! May they both have continued Hatzlacha! Very nice, but does Assembly Member Simcha Eichenstein need to get his photo in this? What's wrong if he does get his photo in? He only got into the picture because you were unavailable. You were probably busy creating a cure for cancer or feeding the world's hungry. I know Shia for a long long time, its not surprising at all what he did.. chesed is in his blood! he's the one who set up the Belz RAV CHESED organization in BP to feed the poor & needy! he also helped Belz in Monsey set up the Rav Chesed org as well... he has a heart of gold!! Agreed. We don't need more pictures of politicians and askonim. The visceral hatred of those that attacked you shows why we don't have the merit of the Moshiach. He is the one presenting the award. If it wasn't for him, no one outside the immediate neighbors/neighborhood would know about the chessed. Assembly Member Simcha Eichenstein deserves credit for all the good that he does. “ Agreed. We don't need more pictures of politicians and askonim. Your freind doesn't 'faargin' Mr.Eichenstein a picture and you blame others why Moshiach hasn't come. I think your head needs a tune up !!! politician a her politician a hin! the main focus is on the kiddush hashem a chasidish yungerman did!!! letting a competition work out of your space, is unheard off!! period! !